The 18th century saw an outpouring of symphonies, with over 10,000 composed worldwide from Sicily to North Carolina. The first release on the AAM’s own label surveys some of the diverse works which were central to the development of the genre, pioneering new sounds and bringing instrumental music to the forefront of European culture. Handel’s Sinfonia from Saul is a stunning example of the multi-movement oratorio introduction which supplied models for the early symphony’s scoring. Works from the cutting-edge Mannheim orchestra by Stamitz and Richter showcase the new sonic possibilities of the form, whilst in his first attempt at a symphony the young Mozart explores his “dramatic and emotional limits” (Richard Egarr). Haydn’s “La passione” demonstrates the mature classical symphony at its finest. 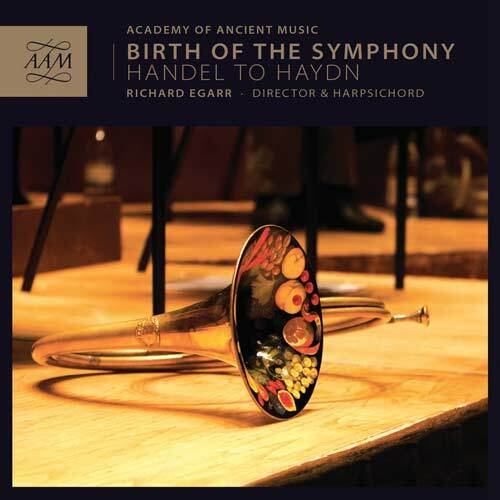 Listen to Richard Egarr introduce ‘Birth of the symphony: Handel to Haydn’ to a live audience at the University of Cambridge.